Fill out the form to receive TABC's Guide to Green Renovations. Contact The Architect Builders Collaborative Inc. for more information. We see so many people who are interested in Green building and sustainable design but aren’t sure what these terms really mean or how to approach building and designing from a Green standpoint. Easy, low-cost ways to make any house into a Greener Home – without renovating! Critical ways to make your home Green when doing a full renovation. Information on hazardous materials to avoid putting in your home. Some need to know terms, products, options and ideas that will help you navigate your Green design process. In this guide we clarify the main ideas behind Green building, explaining how and why we design and build the way we do – what the options are, and what the benefits are to our favourite materials, products and techniques. Helping to lessen the strain on our resources, landfills, and environment is something we all need to participate in. 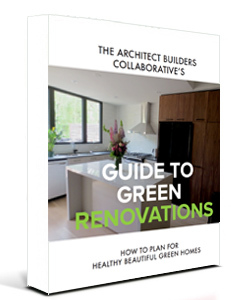 Whether your planning a major home renovation, a new construction project, or just want to make some eco-friendly changes in your existing home, this guide is packed with useful information for making your house into a Green Home.